Well, we have all heard the rumor that Prodigy allegedly left the popular teen group ‘Mindless Behavior’ to go solo. (Story Here). Although, we have not heard a word or official statement from Mindless Behavior and/or Prodigy. It appears the rumor may be true. An industry friend called to inform me that the group has found a new member. It is alleged that the new member will be disclosed when the groups new project drops. 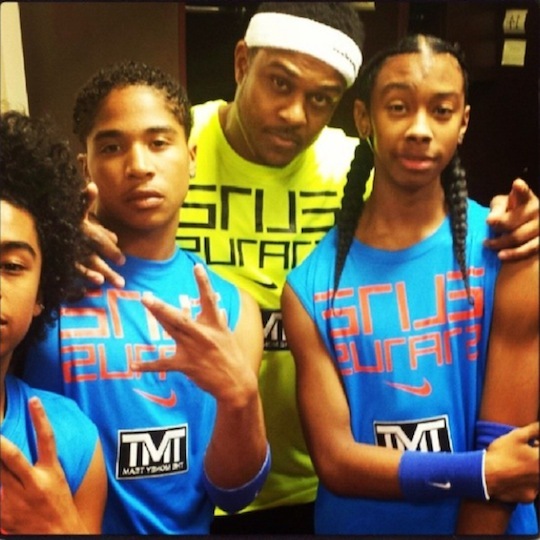 The group was spotted at a basketball charity event recently and there was no sign of Prodigy. Hmmm. There were rumors swirling that Jacob Latimore was the replacement. However, Jacob Latimore denied this, when he sat down with fellow blogger, Tami w Talking with Tami. So, do you think Prodigy made the right movement by considering going solo? Do you think the group’s core fan base will accept the new member? I really don’t get it MB was perfect just the way they were now prod is gone i don’t think MB is ever going to be the same EVER! I don’t think Prodigy would have left Mindless Behavior if things had been good for him in the group. With the exception of Roc Royal, it seemed like the members of the group gave Prodigy no respect, especially Princeton who is known for prancing all over the stage and taking the spotlight away from the lead singer. Considering that Prodigy did most of the cool dance moves and all the lead singing being the only member in the group who could actually sing, they should have given him the respect he deserved. If Walter Milsap and Vince Herbert allow the same disorganization to occur with this reported new lead singer, then they can expect the same outcome as before! MB was allowed to be a free for all. This might have worked if all the other members in the group could equally sing, but having each member prancing gyrating all over the stage upstaging the lead singer was a disaster in the making. A parting suggestion would be for Walter Milsap and Vince Herbert to take a few tips from music group One Direction. All of these guys can hold a tune and sing which justifies each having their moment in the spotlight when performing. Nothing against Princeton as many of us loved all of MB as a group, but to have Princeton who had the least singing talent out of the entire group, prancing, twisting and gyrating all over the stage upstaging the lead singer was not only disrespectful to all the hard work Prodigy put into singing and dancing, but portrayed a lack of management, professionalism and organization from those managing the group! Another problem was the rising episodes of dissention and rivalry coming from some of the MB fans, many not realizing their role as a fan did not give them carte blanche into MB’s personal and private lives! Many of us followed Prodigy from MB since the group debuted their first song and we were most disheartened to hear Prodigy had left the group. We wish him the best and hope his fans remain loyal. We also hope Prodigy realizes that the music business can be brutal if you don’t have strong talent and the image to pull it off successfully. Prodigy is still young with a lot to learn. We are rooting for Prodigy and hope he made the right decision concerning his career, if nothing else some of us understand why he left the group. If MB Management has a new lead singer for the group, one can only hope MB management team does a better job of managing and organizing the group better than they initially did. One can only hope the Mindless Behavior management team recognizes the folly in allowing any member of their group to upstage the lead singer. It’s all about respect, something we believe Prodigy certainly earned but never received from MB management, MB group members nor some of the MB fans! We wish Prodigy the Best! Prodigy(CREG)Please dont leave the group you all are great singers its not going to be right without youall together i Understand your trying to be MINDLESS but what about your fans . I believe Prodigy made a mistake by leaving mindless behavior. The beloved group is what brought him fame, and it is unwise to leave that success behind. If the group was failing or uncompatable then him seperating himself from the group would make perfect sense, but from my understanding the 4 boys were doing just fine together. Sure there were those such as Beyonce and Justin Timerlake that made the same move as the young Prodigy in their younger years, but i must be honest when i say that Prodigy is no Justin Timberlake nor a Beyonce. I am not trashing the young star, i myself am a 16 year-old fan of MB and am upset by the split, but i just personally believe that he will not be as successful on his own and that he made a horrible decision.